Rep. Devin Nunes says he filed suit in Virginia state court on Monday against Twitter, a conservative political operative and two anonymous Twitter accounts, alleging a conspiracy to defame him and oust him from political office. The California Republican seeks $250 million in compensatory and punitive damages for “pain, insult, embarrassment, humiliation, emotional distress and mental suffering, and injury to his personal and professional reputations,” according to the complaint, which was first reported by Fox News. A Republican political consultant based in Arlington County, Virginia, Liz Mair, is responsible for a slew of defamatory statements about Nunes, the congressman claims, as well as two parody accounts impersonating his mother and a cow, the 22nd District Republican said. And Twitter actively participated in the scheme, Nunes claims. The platform censored or “shadow banned” his account in order to diminish his voice and “amplify the voices of his Democratic detractors,” and failed to enforce its terms of service by not banning the parody accounts, the congressman alleges. 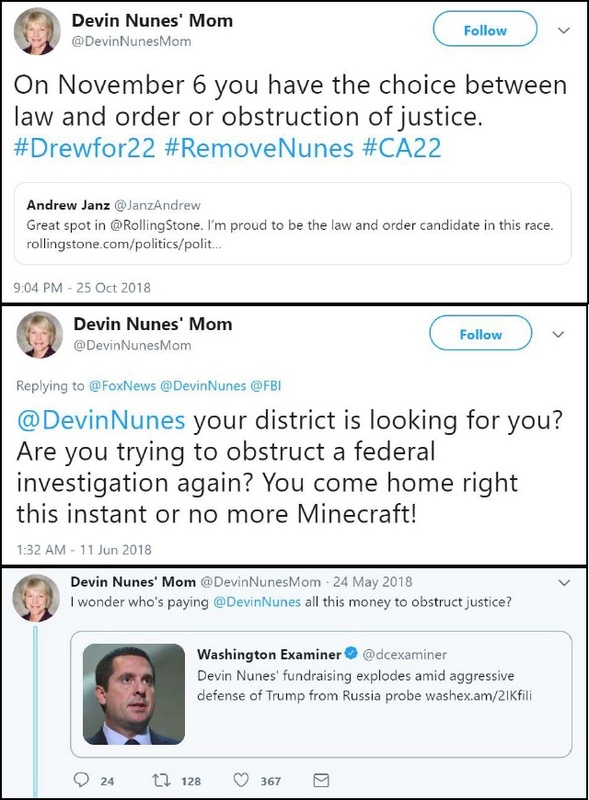 Twitter only banned the account @DevinNunesMom after the congressman’s real mother, Toni Dian Nunes, filed a complaint. The extant parody account, @DevinCow, has accrued thousands of followers since news of Nunes’ lawsuit broke. According to the complaint, @DevinCow recently had just 1,204 followers; the account had nearly 60,000 as of Tuesday morning. A spokesman for Nunes did not immediately reply to a request for comment.